Now you can buy Google Apps with Bitcoin! Did you know that you can buy Google Apps with Bitcoin? That dream is now a reality for the Bitcoin community. Google’s response to Apple cracking down on some Bitcoin applications is very telling . There is a new opportunity for these two companies to compete and the groundwork is being laid out. Expect this story to develop over time with other established companies placing their respected bets in this new territory. Payment processing has officially entered a new market. Bitcoin’s inherent ability to produce safe transactions, at a scale and price better than any other technology, has received Google’s attention. Apple is pushing it’s own payment processing system, iBeacon. Google’s chips are placed on Bitcoin. Game on! Netkiller accepts Bitcoin for Google Apps buyers! Sunnyvale, CA — Dec 13, 2013 / (http://www.myprgenie.com) — Netkiller, Google cloud solution provider and Google Apps partner, now accepts bitcoin from Google Apps clients. Google Apps is an email and online collaborative service provided by Google and the price is $50 per user per year. 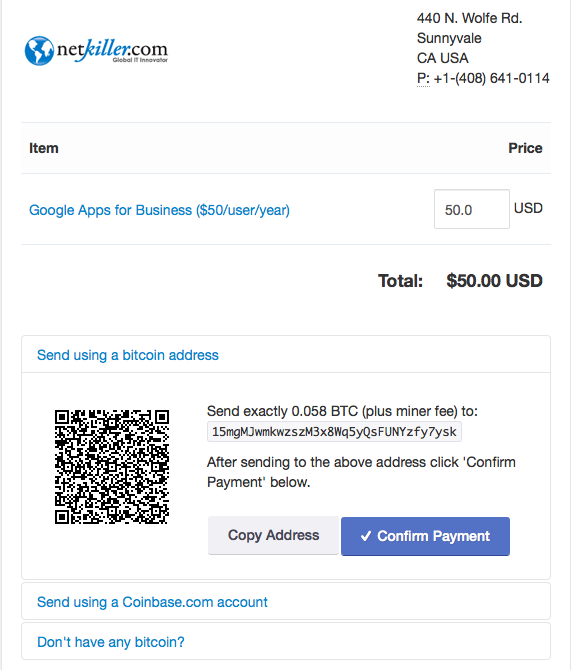 Purchasing Google Apps with bitcoin is a simple process; upon getting an invoice to make a purchase, the client can find the Netkiller bitcoin address as well as a payment link. Client can send the Bitcoin currency (BTC) or click the payment link provided below to check out. Upon entering the US dollar equivalent, it will check out after automatically converting US dollars to bitcoin at the then current rates. ← South Korea: Bitcoin: Currency for the future?